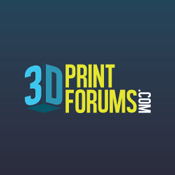 3D-printed smart implants for the repair of large bone defects may soon be a reality through the European Union's PRosPERoS (PRinting PERsonalized orthopedic implantS) project. Researchers aim to engineer printable, personalized and biodegradable patient-specific implants, made with magnesium and zinc alloys, by accurately scanning vertebrae with advanced imaging techniques. Read more. Titomic, based in Melbourne, Australia, recently built a 3D metal printer with the potential to manufacture aircraft wings, ship hulls, submarines and rocket fuselage. The printer, the world's largest at 40 by 20 m, tested for the first time at an unveiling ceremony in Melbourne. It produces metal objects to 9 m long, 3 m wide and 1.5-m tall, and is configurable to even larger settings. Read more. 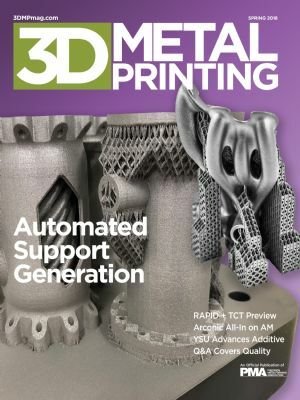 SLM Solutions is teaming with Altair for a June 20th webinar on the benefits of designing medical devices with topology optimization for metal additive manufacturing. 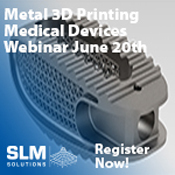 Register today to learn how companies are increasing functionality while decreasing costs by combining design optimization and selective laser melting using the example of an orthopedic lumbar cage. Coherent, Inc., the Santa Clara, CA-based provider of fiber-laser solutions, has made its first investment in the metal AM market with the acquisition of OR Laser, the Germany-based maker of Orlas Creator 3D metal printers for small and medium enterprises. Read more. The Youngstown Business Incubator (YBI), working to expand its global AM footprint, announced earlier this month its latest partnership with Print C-B, an Israel-based provider of copper inks for printed electronics. YBI also partners with The Junction, a business accelerator located in Tel Aviv, Israel. Read more. 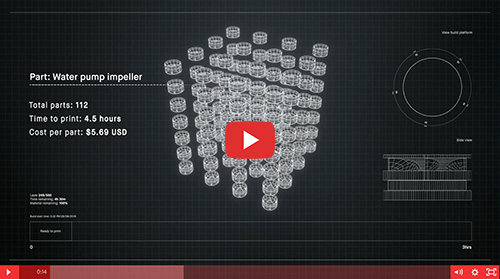 A 2018 Gold Edison Award winning innovation, the Desktop Metal Production System uses single-pass jetting to builds parts in minutes versus hours. Read more. The pace at which offerings are hitting the market is amazing, and the dizzying array of capabilities all along the AM spectrum promise to make quite an impact. With $10 million in funding, myriad processes and equipment, and an impressive faculty leading the charge, YSU research impacts aerospace and more. ☉ 3D Enables Rethinking of Design Approach… and that's exactly what the coolant-system experts at Grindaix did with the help of Bionic Production and Trumpf. 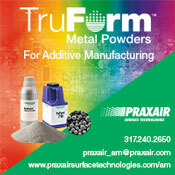 See also: Praxair Surface Technologies, SLM Solutions NA, Inc., TRUMPF Inc.